The Great Jones Hotel could be offering overpriced rooms as soon as Feb. 2010. The construction projects of Noho are a confusing lot. With their Bond, Great Jones and Lafayette Street addresses (some with all three! ), they're a bit hard to keep straight. Which is why we're a little lost on 25 Great Jones Street, a languishing property (and former home of the dearly departed Jones Diner) suddenly sprouting a long-promised hotel. Have we seen the renderings? Who's the architect? Is Chuck Close at all involved? Good questions, all. 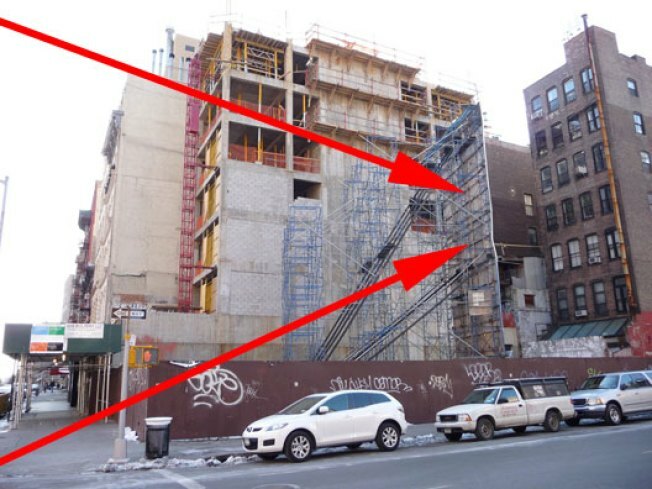 According to EV Grieve's photos, estimated completion is Feb. 2010, and a building permit points to a 13-story hotel (11 on top of the two-story building already on the site) designed by Dumbo-based TKA Studio. It appears the narrow lot doesn't include the piece along Lafayette, home to some notable advertecture over the years. Any renderings floating around? Hit us up.